No commitment, just the single! Warner Bros has debuted the first official trailer for the comedy How to Be Single, playing next February for all the lonely single souls out there (or couples who just want to laugh at the singles). Rebel Wilson stars as a wild young woman in New York City who teachers her friend Alice, played by Dakota Johnson of 50 Shades of Grey fame (so doesn't she already know all this stuff? ), how to hook up and mingle with men the right way. The cast includes Leslie Mann, Jake Lacy, Anders Holm, Alison Brie, Damon Wayans Jr., Nicholas Braun. This is mostly for the ladies, but have fun anyway. There's a right way to be single, a wrong way to be single, and then… there's Alice. And Robin. Lucy. Meg. Tom. David. New York City is full of lonely hearts seeking the right match, be it a love connection, a hook-up, or something in the middle. And somewhere between the teasing texts and one-night stands, what these unmarrieds all have in common is the need to learn how to be single in a world filled with ever-evolving definitions of love. Sleeping around in the city that never sleeps was never so much fun. How to Be Single is directed by German filmmaker Christian Ditter, of The Crocodiles previously. The script is by Dana Fox, Abby Kohn and Marc Silverstein. 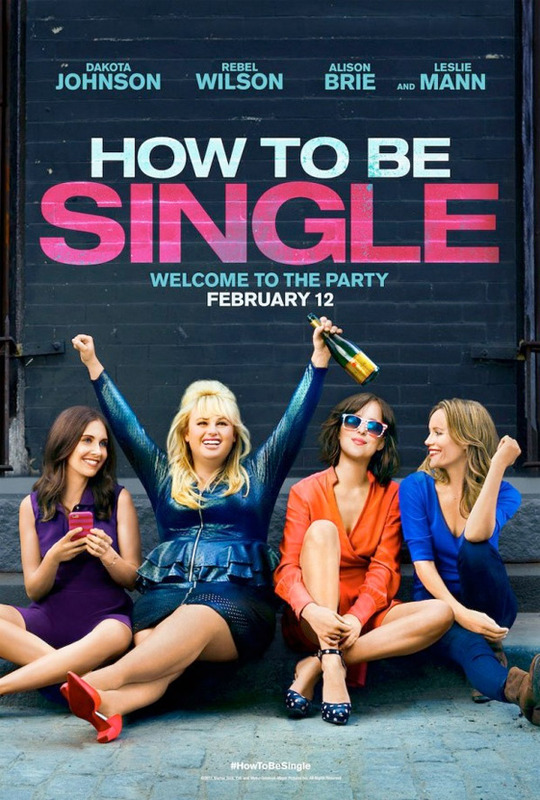 WB releases How to Be Single on February 12th, 2016. That trailer seemed like it was about 4 hours long. This is a movie I would go see with my girlfriend, but joke's on you "how to be single" I don't have a girlfriend! I'll ditch mine to go see this with you! Bro night out? I'll bring the beer if you bring the red vines! Maybe worth it for the two seconds of Alison Brie. Really got bored watching the trailer. I want more Leslie Mann and less Rebel Wilson.